The Gulf of Mexico resembled an aquatic desert. It was a barren landscape with little to no life left after the 2010 Deepwater Horizon oil spill polluted the waters and masked any-and-everything in a thick layer of dark sludge. Although the spill was a devastation to coastal communities and local wildlife, it transformed and expanded the way the scientific population viewed the area. Without the accident, Drs. Suzanne Fredericq and Sherry Krayesky-Self may not have made the breakthrough that could potentially affect all levels of the planet’s food chain. “What we’ve learned will revolutionize the way we look at the ocean and at life,” said Fredericq, a University of Louisiana at Lafayette biology professor. For the last 20 years, Fredericq has been collecting samples of macroalgae — algae visible to the eye, like rhodoliths and other seaweeds — and creating a database of her findings. However, when the accident occurred, she said she knew any life that once surrounded those rhodoliths — unattached, crust-forming algae — had been killed off. Still, out of habit, she collected her samples anyway. Back at the lab, Fredericq and Krayesky-Self, a master instructor of biology, were examining the newest finds. “We were looking at the dead-looking rhodoliths and thought, ‘Well, if there isn’t anything on the outside, what about the inside?’” Fredericq recalled. Jokingly — and to the surprise of some —, Krayesky-Self grabbed a hammer and cracked open a sample. What they found would make them reanalyze the way they looked at the entire organism, or holobiont. Hidden inside were unusual roundish structures within the rhodolith's cells. Krayesky-Self used electron microscopy to reveal that the rhodoliths were harboring an abundance of microalgal stages, or algae too small for the eye to see. DNA tests were then performed, and the results confirmed the findings were unknown stages in the life history of bloom-forming microalgae. This discovery led to the idea that the rhodolith holobiont acted as seed banks for community regeneration and as a temporary reservoir for life history stages of bloom-forming microalgae. So what does all of this new information mean for the ecosystem? Rhodolith beds, which are well-known habitats for diverse benthic communities, can be found all over the world. And the scientists stressed that it’s not just wildlife that will be affected. For example, fisherman who solely catch barracuda could potentially lose their livelihood. The salt water fish known for their ferocity often feed on smaller reef fish, and these smaller fish generally consume algae as their primary food source. If the algae are killed off in incidents like the oil spill, then that could lead to a ripple effect in the food chain. But there is the good news. “At the base of the food chain, with this discovery, we are learning that this community of algae has the potential to rebuild itself if something happens,” Krayesky-Self said. The researchers’ findings recently earned them a three-year National Science Foundation grant of $893,911. The award will enable the researchers to further examine this new world of life from all angles, as well as inspect the rhodoliths’ anatomy, assess seaweed biodiversity in the northwestern Gulf of Mexico, and explore any possible lingering impacts of the 2010 Deepwater Horizon oil spill on the health of these important organisms that are at the base of the marine food chain. The first thing the scientists did after receiving the award was to go on a nine-day excursion off Louisiana’s shore near the Texas border to collect more samples. The grant will also allow the professors, who are joined by a team of two other UL Lafayette seaweed specialists in the biology department, Drs. William Schmidt and Joseph Richards, to hire both undergraduate and graduate students to contribute to the project. “There’s so much more to know that we just want to keep adding to the pile,” Fredericq added. Photo captions: Top, Drs. Sherry Krayesky-Self (left) and Suzanne Fredericq inside the wetlab on UL Lafayette's campus. Above, samples of rhodoliths and other marine life inside the wetlab. 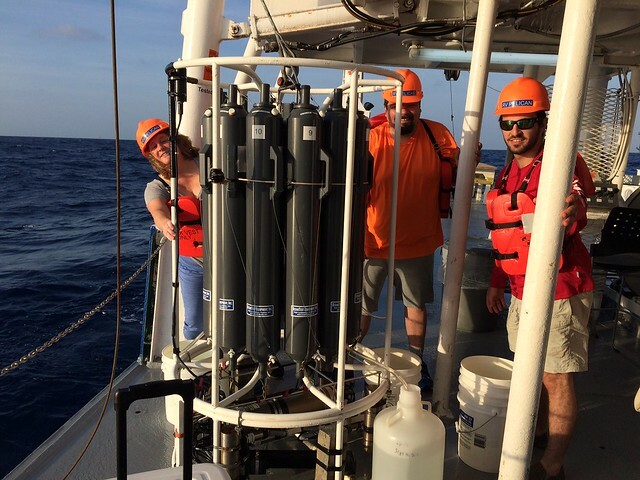 Below, University of Louisiana Department of Biology seaweed team aboard the R/V Pelican research vessel during a May 2018 NSF-funded rhodolith-collecting cruise offshore the northwestern Gulf of Mexico.